It was evident from the onset Tuesday night that the opening match of the Pioneer League Championship Series would be decided by whichever offense could put on a bigger show at Suplizio Field. Rookie-level Great Falls got ahead of Grand Junction, 10-8, after three innings, but it took a late boost from an early contributor to put the game away for the Voyagers. 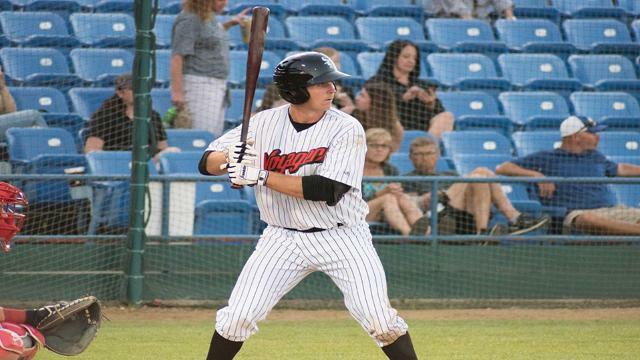 White Sox first base prospect Ryan Fitzpatrick homered twice on a three-hit night and drove in four runs as the Voyagers outslugged the Rockies, 12-9, in Game 1 of the best-of-3 Finals. It marked the first career multi-homer game for the 23-year-old. "I'm glad I can help the team win, that's all I'm concerned with," said Fitzpatrick, who also singled and struck out. "Now we're one more win from a championship." The 22nd-rounder out of UC Irvine this June batted .246/.389/.444 with six homers, seven doubles and 15 RBIs in 41 regular-season games. In July, Fitzpatrick went 16-for-46 (.348) at the plate, but he matched his RBI output for the whole month Tuesday. He singled twice in six at-bats in the semifinals against Billings. Great Falls led by seven runs after Fitzpatrick's three-run shot to center field on a 1-1 fastball from Jesse Stinnett in the second inning, but the Grand Junction cut the lead, 10-9, on Hunter Stovall's solo shot in the sixth. "In Grand Junction the ball flies. I think from the start our whole lineup had a pretty good approach," Fitzpatrick said. "We were hitting balls hard and we were executing well, when we had the [big] lead, we felt pretty good." The Laguna Hills, California, native was able to respond immediately for the Voyagers, widening the gap with a solo shot to left-center to lead off the seventh. "Grand Junction is a heck of a team and we knew they were going to battle, so we knew that we had to keep adding on and we did that well," Fitzpatrick said. "Right when I hit [the second homer], I knew it was out. Another fastball." Bryce Bush fueled the Voyagers' five-run first with a three-run blast to center, his only hit in four at-bats. Romy Gonzalez and Travis Moniot added three hits apiece. Gonzalez scored twice and drove in a run. Gunnar Troutwine doubled twice, once to drive in the final run in the first, and scored Great Falls' 12th run on a balk by Grand Junction reliever Cayden Hatcher. Stovall had two RBIs, scored twice and reached base five times after adding on a double, being hit by a pitch and walking twice. Niko Decolati smashed a two-run homer, singled and drew a walk with the bases loaded. Pioneer League MVP Coco Montes and catcher Javier Guevara both had two singles and two RBIs. Both teams used six pitchers to get through the contest. Lane Ramsey was credited with the win after allowing a hit and a walk in a scoreless seventh and Nick Johnson recorded the final six outs, three by strikeout, to earn the save. Both sides went the entire game without a 1-2-3 inning. "It's playoff baseball, so every single pitch is important, and you got to stay focused," Fitzpatrick said. "It's tough, a long game like that, a lot of pitching changes, but when you got a chance to win a championship, you can stay focused a little bit more than usual." The series shifts to Great Falls for Game 2 at 7 p.m. ET on Thursday.